CAS Latency (CL) Ratio is a crucial while purchasing the add-on RAM. However, the RAMs with different CL Ratio can cause serious damage to the motherboard. Not only CL Ratio but also different clock speed of RAM also hampers the health of the PC. That’s why it’s recommended to use RAM with same CL ratio and clock speed. Follow the below steps to find out CAS Latency (CL) Ratio. If that CAS#Latency (CL) is 9.0 clocks then your system currently running on RAM with CL9 Ratio. Which means if you want to upgrade the total RAM size without replacing the existing RAM, then you must purchase another RAM with same CL ratio and clock speed. Be careful with about DRAM Frequency and Clock Speed, which may confuse you while a selection of RAM. 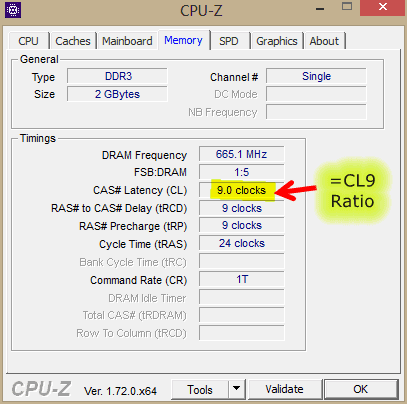 If you are Windows 8 or 8.1 users, then you can easily find out clock speed. It is located under Task Manager (Press Ctrl+Shift+Esc) > Performance > Memory. Alternatively, visit a Wikipedia to find out clock speed when you know the DRAM Frequency or Command Rate. Moreover, the SPD tab in CPU-Z reveals detailed report of your RAM. Alternatively, you can Google for the current part number and manufacturer to dig exact information about your current RAM. It may helpful to predict the second RAM. It’s better to choose the RAM from the same manufacturer for utmost compatibility. Hope this information will help to purchase your next RAM. 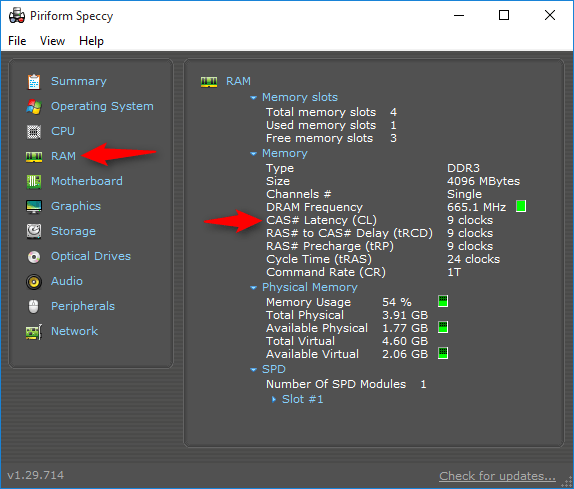 Piriform Speccy is another good utility to fetch out CAS Latency (CL) Ratio. It also reveals tons of information of your device. It has the ability to show live uses graphs and temperatures of various components. You can export those details as XML, text file or print / PDF. Just open the app navigate to RAM section. Now you can view Slot information, type, size, CAS Latency (CL) and much more. See the following screengrab.